This new line of cleanroom vacuum includes a multistage filtration system, a standard stainless steel design and a quiet 61 dB noise level as well as many 32mm accessories.. 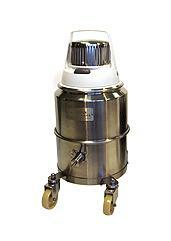 The IVT 1000CR Vacuum is comes with the Nilfisk Safe-Pak Container for safe collection, containment and disposal of potent compounds, perfect for work with pharmaceuticals. The container is sealed, and features a paper bag at the inlet and a HEPA filter on the exhaust. The entire container can be disposed of when full.